Now with over phourhundred entries. 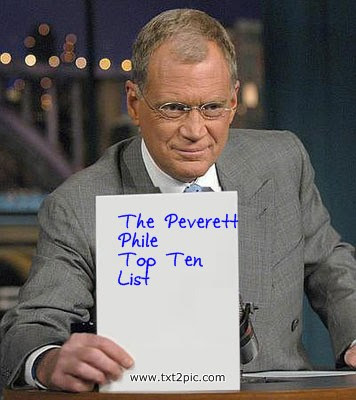 Hey, kids, welcome to The Peverett Factor. 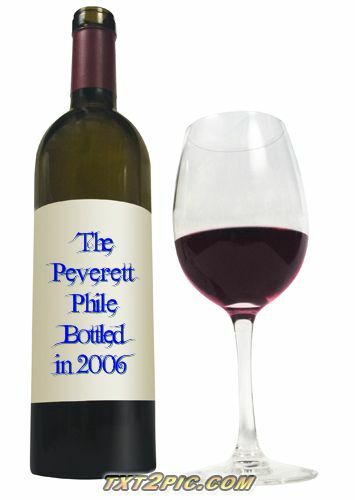 The Peverett Phactor. The Phile Phactor. The P-Phactor. Oh, screw it. 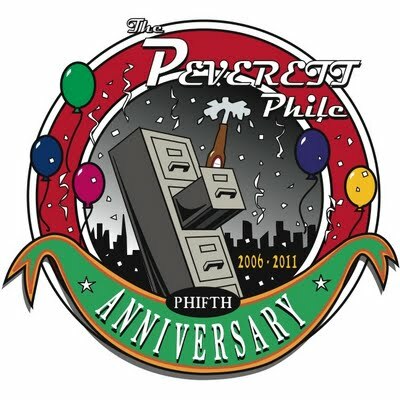 The Peverett Phile. Did I ever tell you how much I dislike the name of this blog? I am stuck with it. Anyway, how are you? There’s a new 24-hour hotline for illegal immigrants who have questions about deportation. The number is really easy to remember: it’s 1-800-A-TRAP. China is now grading restaurants’ hygiene using smiley faces and frown faces. Really? Who do they have working on this stuff in China, kids? Oh. Do you like Wendy's? I am not a big fan, but Wendy’s just introduced a new burger with extra cheese, thicker beef, and a buttered bun. Which explains why in their logo, Wendy is now wearing Spanx. Because of Hurricane Irene, the northeast is experiencing a pumpkin shortage. On the bright side, Snooki has tripled her personal appearance bookings. During a fundraiser in New York the other night, President Obama said he was quote “in a New York state of mind.” Of course, in a year he might be singing that other Billy Joel song, “‘Movin’ Out.” The newly opened IHOP in New York City has hired a bouncer for the door. Yeah, it’s a little different than a club. If you look attractive and well-dressed, you actually can’t come in. A new study found that quitting smoking can actually improve your memory. Which explains why President Obama is finally starting to remember those campaign promises he made. Steven Spielberg is going to release a biopic about Abraham Lincoln next year. Right, that’s a good way to honor Lincoln... by sending people to the theater. Arnold Schwarzenegger has a new memoir that will focus on his career as a body builder, action star, and politician. You can find it in that section at Barnes & Noble marked "Trying to Change the Subject.” It's sad that I couldn't use Border's in that joke. NASA is developing space taxis to shuttle astronauts to the International Space Station. And just like New York taxis, they’re all going to be driven by aliens. 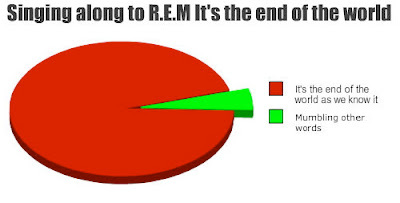 Yesterday I mentioned R.E.M. had broken up. It reminds me of the pie chart I made a long time ago. I love pie charts. So, you heard that "don't ask, don't tell" had been retired, right? Well, there's a new inspirational poster to celebrate this. Check it out, kids. 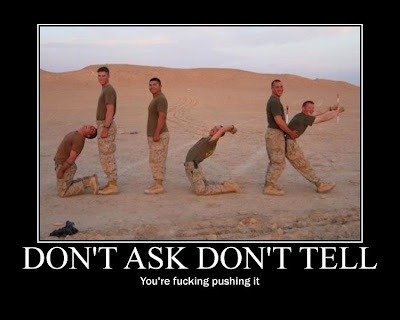 I have to be honest, when I first saw the poster I couldn't figure out what they were trying to spell out. Here's some sad news, Arch West, a retired Frito-Lay marketing executive credited with creating Doritos as the first national tortilla chip brand, died in Dallas at age 97. 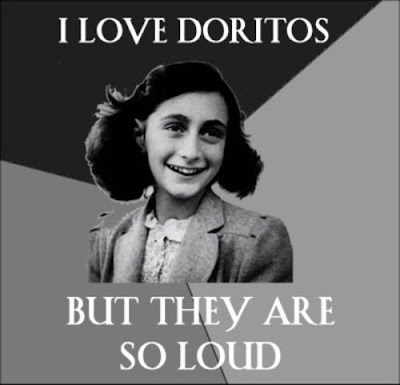 Did you know Anne Frank liked Dorito's? 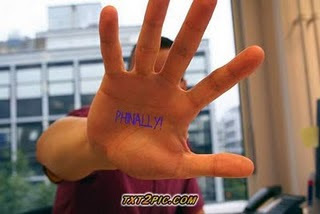 I have proof. Take a look at this ad. 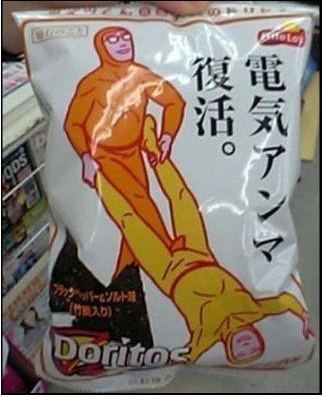 While we're on the topic of Doritos, did you ever see what the bag looks like in China? I think it's China. Anyway, here it is. Today's guest is a really talented singer songwriter who is easy on the eyes. 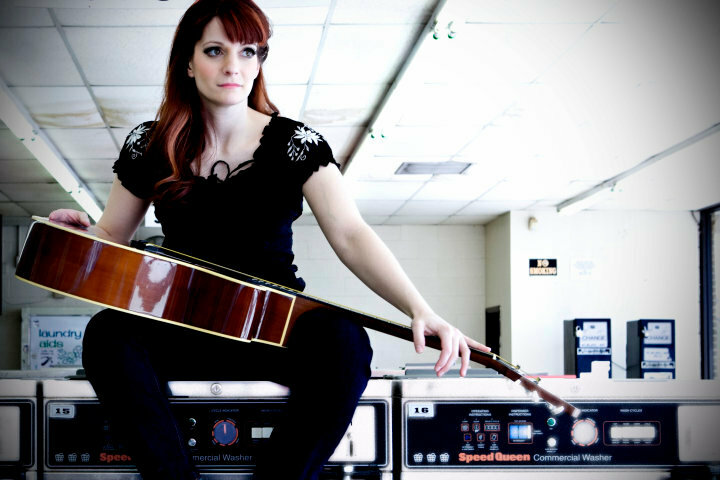 She has a brand new CD out called "Cumberland Moonshine" which is available on iTunes. Please welcome to the Phile... Renee Wahl. Me: Hello, Renee, welcome to the Phile. How are you? Renee: Hi, Jason! I’m very well and glad to be on the Phile. Me: Okay, are you from Pennsylvania, Renee? Did I read you're from Harrisburg? My wife is from Camp Hill, near Harrisburg, and your album is titled "Cumberland Moonshine"... where did you go to high school? Did it have Cumberland in the title? Renee: I’m originally from Harrisburg, but I’ve been in Nashville since 2007. I’m very familiar though with Camp Hill! I actually graduated from Camp Hill (I lived on the “West Shore” during my high school years). I did have friends though that went to Cumberland Valley HS. You’ll have to tell me your wife’s name offline… maybe I know her. It’s such a small world, Jay. Me: Where did the title of the album come from? Was it named after Cumberland Valley? Renee: I am originally from Harrisburg, but I also lived in Camp Hill and Philadelphia and also in South Carolina, Maryland, and New York. Me: The album was recorded in Nashville, right? If you're gonna make a country record, Nashville is where you wanna record it, not Harrisburg. LOL. How did you like Nashville? It's one of my favorite cities and we almost moved there in '05. Renee: I LOVE Nashville! It’s quite a bit like being in PA and there’s just so much to do here. And while it’s known for Country music, there really is such a great and diverse music scene. And it certainly doesn’t hurt to record an album here with all the great talent available! Me: Your album is great, and what an impressive band on it, Renee. Who is in the band? There's a lot of players, right? Renee: Thank you very much for the compliment! I’m really glad you like it! Gosh, there was a tremendous amount of talented musicians on this album and I am so happy that they took the time to work on this. I had a lot of players because everyone had so much to contribute. The three main players who were there for all the tracking were Charlie Chadwick (Suzy Bogguss) on bass, Kenny Vaughan on guitar, and Bryan Owings on drums. Charlie played Bass and also engineered and co-produced the album. Kenny is Marty Stuart’s guitarist, and was nominated for this year’s Americana Music Association’s Instrumentalist of the Year! Bryan tours and does studio work for Buddy Miller, Emmylou Harris, Patty Griffin. I was also very happy to have players like Fats Kaplin (Mark Knopfler, Garth Brooks, Waylon Jennings), Charles Treadway (The Dynamites), Pat Bergeson (Shelby Lynne, Lyle Lovett), Roger Prescott (Trainwreck Ghost, Texacala Jones), and Dave Mohr (Remedy Drive). Me: Do you have a second band that you tour and play live with? 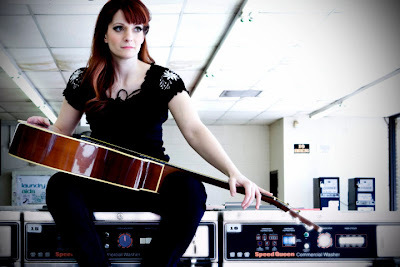 Renee: I do have a regular group of musicians that I play with for live shows. And I play anything from solo acoustic shows to live band events. Me: I am a big fan of Neko Case and Maria McKee, who I have been trying for years to get on the Phile, and your record reminds me of them. Are you fans of the women I just mentioned? Renee: Again, thank you so much for the compliment! Yes, I’m a big fan of Neko Case and Maria McKee from Lone Justice. I grew up listening to Lone Justice, though I never saw them live. Both women have a huge influence on my music. Me: Who else did you listen to growing up? Renee: There was a lot of “listening to music” in my household. My parents would sit around playing records on the weekends, so from the time I can remember I heard a lot of the Beatles, Elvis, Dolly Parton, Crystal Gail, Ruby and the Romantics, Skeeter Davis, the Association. Other bands that had the most influence on me growing up were the Ramones, Chris Isaak, Dwight Yoakam, the Cure, Lone Justice, Wanda Jackson, Cyndi Lauper… way too many to list! Me: I have to ask you about the art work on the cover. Who did the the drawing, and whose idea was it to have a drawing of you and not a photo? Renee: My friend Jenni Hecker-Prescott did the artwork. She’s such a brilliant artist and I’m so thankful she took the time to create this beautiful piece for the album. I’ve always been partial to album artwork versus a photo. I wanted to grab the audience’s attention right away with something different... and it’s not just a CD cover, it’s artwork you can display! Me: You went to Wagner College in New York, am I right? Did you study acting? Renee: I was a musical theatre major with a concentration in vocal performance while I was there. So yeah, I studied acting, dance, voice and all that fun stuff! I pretty much started playing piano at 6 and began acting by the age of 10, so going to school for the arts really just seemed like the natural progression. Then of course I joined the Air Force and changed my major to Physics, so that was pretty much the end of acting, but I continued to play in bandsJ I can, at least attribute my degree in Physics to music. I decided I was going to create a way to travel back in time to meet the Beatles, so I started checking out Physics books in the library… still working on it! Me: Is acting something you might do in the future? Renee: You know, I hadn’t thought about it until recently. The city of Nashville is bringing more and more films and tv shows here to film, and I’ve already been involved with the movie Country Strong and an upcoming FX TV show “Outlaw Country”. If you watch Country Strong I’m in the stage scene toward the beginning of the movie. So, yeah, I would definitely like to get back into it eventually, but I’m really just concentrating on music right now. Me: What's this, you were in the Air Force? How long, and when did you leave? Renee: Yes, I was in the Air Force! I enlisted in the Air Force Reserves after high school and my specialty was Air Transportation…basically loading aircraft and air terminal operations. Then when I finished my degree, I took an active duty Commission as an officer and became an Air Force Physicist. It was pretty cool. My first assignment as an officer was at the National Security Agency. I left there for an assignment in Nashville in the AFROTC department at Tennessee State University. It’s been just under two years since I left to do music full time. Me: Renee, thanks so much for being on the Phile, I hope it was fun, and I hope you can come back soon. Go ahead and plug your sites and please come back soon, okay? 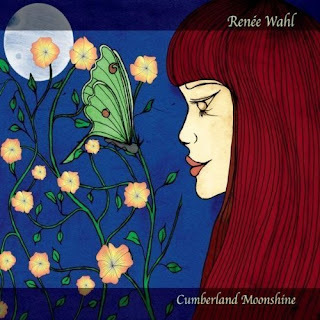 and Reverbnation: reverbnation.com/reneewahl. And, of course, “Cumberland Moonshine” is available at Amazon and iTunes. Me: Thanks again, Renee, I love the album. Renee: Thank you, Jason! 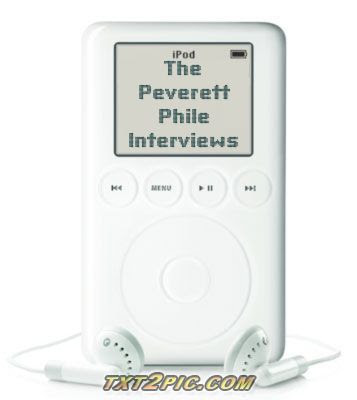 And thank you for taking the time to have me on the Phile! There you go, kids. Thanks to Renee for a great interview. I love her album. I have a copy of it that I played quite a few times on the way back and forth to work. Now I wanna go rent Country Strong. Anyway, the Phile will be back next Sunday with stand up comedian, actress, radio talk show hostess and snake wrangler Savannah Boan. And then next Monday with it's Jon "Bermuda" Schwartz who is "Weird Al" Yankovic's drummer. So, spread the word, not the turd. Don't let snakes and alligators bite you. Bye, love you, bye.